The progress in molecular medicine and oncology leads to further development of diagnostic techniques in oncology. It is also related to specific treatment techniques. Our workshop has a goal to present how novel innovation in molecular oncology facilitate a transition from basic to clinical research. The traditional diagnostic in cancer filed is based on tumor morphology that was established over 100 years ago. The molecular characteristic of tumors and epigenetic leads to new diagnostic techniques such as: liquid biopsy, Raman microscopy, and personalized medicine. This workshop is addressed to young researchers, PhD students and doctors interested in molecular biology and oncology. 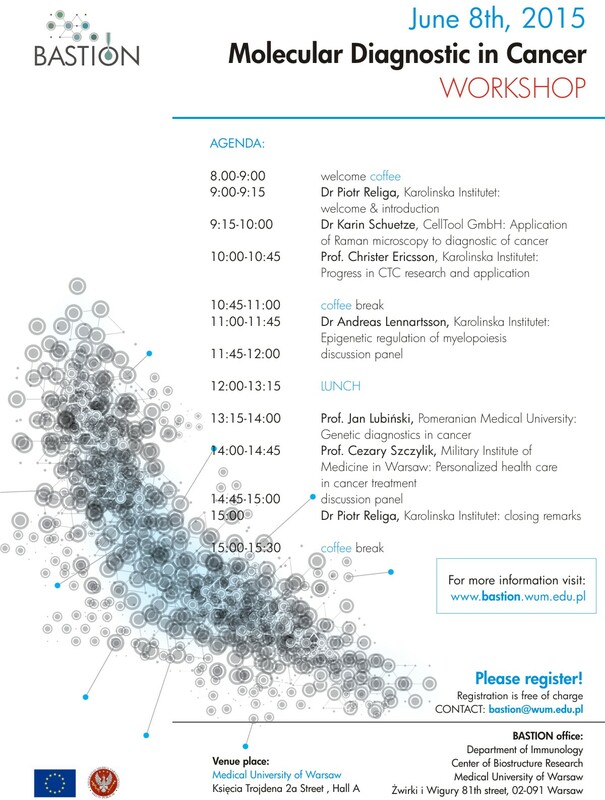 The speakers for this year edition of workshop will be: Dr Karin Schuetze from CellTool GmbH, Prof. Christer Ericsson, Dr Andreas Lennartsson and Dr Piotr Religa from Karolinska Institutet, Prof. Cezary Szczylik, Military Institute of Medicine in Warsaw and Prof. Jan Lubiński from Pomeranian Medical University.